Experimental Theology: The Theology of Peanuts, Prelude: Is Peanuts Funny? The Theology of Peanuts, Prelude: Is Peanuts Funny? It might seem odd to seek theological edification from a comic strip. So, to begin, an apologia. The theological richness of Peanuts can be hinted at by beginning with an intriguing question, "Is Peanuts funny?" The answer is yes, of course. But we quickly must nuance that answer by noting that Peanuts is funny in a very dark and peculiar manner. The darkness of Peanuts was signaled in the very first Peanuts strip published on October 2, 1950 (shown above). Charlie Brown walks innocently past two children sitting on the curb. As Charlie Brown approaches and passes by the little boy repeatedly intones, "There goes good ol' Charlie Brown." And yet, as soon as Charlie Brown exits the picture, the boy gives us the punch-line: "How I hate him!" Peanuts is funny. But it is also dark and mean and tragic. "The children affect us because in a certain sense they are monsters: They are the monstrous infantile reductions of all the neuroses of the modern industrial civilization...In [these children] we find everything: Freud, mass-cult, digest culture, frustrated struggle for success, craving for affection, loneliness, passive acquiescence, and neurotic protest." Peanuts is an "encyclopedia of contemporary weakness." Love does not come easy in Peanuts. As David Michaelis, Schulz's biographer, has noted, "In [Schulz's] work, indifference would be the dominant response to love. When his characters attempt to love, they are met not just by rejection but by ongoing cold, even brutal, indifference, manifested either as insensitivity or as deeply fatalistic acceptance." In sum, then, we find in Peanuts an extended meditation on pain, suffering, and alienation. 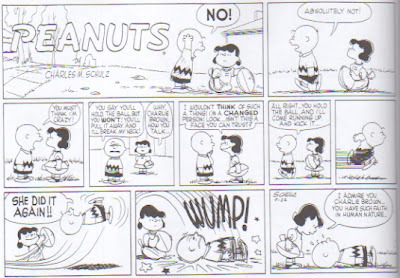 As Eco notes, Peanuts is a "version of the human condition." Thus, the primary theological thrust of Peanuts centers on these themes. Peanuts is theological because, in a very real sense, Peanuts isn't funny. We often laugh with Peanuts because we identify with it. We encounter the shock of pain in Peanuts and recognize it. And that intimate familiarity with our deepest pains, longings and insecurities makes us smile. And even laugh. We have been understood. And this comforts us. But to be properly theological Peanuts must do more than simply portray our suffering. Peanuts must have some positive message. And it does. But before that message is heard we must first fully encounter the deep tragedy and cruelty of Peanuts. Otherwise, the wisdom of Peanuts will seem trite, facile, and cute. We must read Peanuts as Christians. Which is to say that we adopt the dialectic of death and resurrection. Death first, then resurrection. Only if we first immerse ourselves in the pain of Peanuts will its positive arguments appear wise and deep. And beyond Charlie Brown's Herculean feats of endurance we also encounter the spirituality of Linus and the joy and eros of Snoopy (Snoopy, we should note, is the only one who kisses in Peanuts). In sum, if we take the cruelty of Peanuts seriously we will also find resources for positive theological contemplation. Specifically, how can community, joy, and peace emerge in a cruel and competitive world? This online book is my attempt to use Peanuts to answer that question. (4) p. xii. The Complete Peanuts, 1955-1956. Fanatagraphics Books. This entry was posted by Richard Beck. Bookmark the permalink. "Finally he sent his son to them, saying, 'They will respect my son.' But when the tenants saw the son, they said to themselves, 'This is the heir. Come, let us kill him and have his inheritance.' And they took him and threw him out of the vineyard and killed him." Charlie Brown is the innocent one. he does nothing wrong. He is kind to everyone and has what seems to be a naive hope that they will change, but he is completely aware of how people around him despise him. So he forgives over and over again and continues to hang out with these people who betray him and openly confess their derision for them. The question is why do they despise him? Why do they reject him? It is in this way that he represents "The stone that the builders rejected (who) has become the cornerstone" for what is the comic without Charlie Brown - the only source of goodness? but the lesson is that we reject the source of the Good and goodness in general and give in to evil towards one another. Schultz uses irony as a medium for humor and in a very strong sense was a master of critiquing modernity. Peanuts is the peanut gallery that heckles the performer - Charlie Brown. Fee fee, fi fi, fo fo from I smell smoke in the auditorium. He's a clown, he's a clown. He's gonna get caught just you wait and see. "Why is everybody always picking on me?" He's a clown that Charlie Brown. He's gonna get caught, just you wait and see. "Why is everybody always picking on me?". Who's always writing on the walls? Who's always throwing spit balls? Who's always dancing in the halls? Who me? Yeah you! Thats who! Who calls the English teacher Daddy-o? He's a clown, that Charlie Brown. As an adult, would he be a petty criminal? Schulz's world is occasionally a sad world, a bewildering world, even ironic. But it is not our world. It is a mild world--a world without severe trauma, illness, deep heartache, and death. Given Schulz's own life circumstances, he may have been stoically softening his own pain via his characters and their setting. Still, a theological and psychological exploration of the comic strip is rewarding. Richard- Now maybe you can tell me why I have always identified with this comic strip. It has always been my favorite since it came out in 1950. I'm 62.I have always wondered what it was that attracted me to it. I'm looking forward to your insights. An interesting line of inquiry if you'll forgive one of the apostate for chiming in. A couple of minor objections. First,have to disagree strongly with Eco. The behaviors of the Peanuts gang are not symptomatic of modern neurosis, IMHO. Mankind has always sufferred from these bad behaviors. In fact from the days when dwarf-tossing and bear-baiting were as common and accepted as football to now one could argue that there are major improvements. But that, in fact, is all to the good. Because these problems are deeply rooted in human nature and have been with us forever. And smack in the middle of things religion and religious practices should be concerned with - how do we cope with an imperfect world ? And the slings and arrows of our compatriots who can make it both better and worse. I am reminded of my lessons from Job - the world is neither fair nor unfair, it is. But as a consequence of it's natural characteristics bad things happen to us all on occaision and we need to learn to cope. A point that James made as well. That's an interesting take. It sets up the strip in Girardian terms, where Charlie Brown functions as the scapegoat and, via identification, aligns our sympathies with him. He is innocent. That's a great song. On a different note, I'm reading Mark Heim's "The Depth of Riches" and he devotes a whole chapter to Dante's Comedy. That chapter and your posts made me (finally!) want to read it through it cover to cover. Is there a version/translation that is best? When I was child I, like many, was taken with the exploits of Snoopy and the Red Baron. It's only recently that the broader implications of the strip have dawned on me. Mainly through Michaelis's new bio. It's interesting you bring up Job. The positive recommendations in Peanuts, in my opinion, takes most of its impulse from the OT Wisdom literature. Thanks, all, for commenting. I was wondering how many people would find interest in this series. I don't know many of the younger generation know Peanuts well. Thus, I'm going to try to provide examples of the strip through the posts. Again taking a note from Michaelis. Looking forward to hearing your thoughts on Peanuts... it is amazing on what we can learn from ourselves from a cartoon like Peanuts! It's interesting that Schulz was bullied in school, and his response was to create a "good" character that HE could bully around in his strips. Making him feel superior and giving him the satisfaction of being "above" Charlie Brown. From my view, Schulz was a bitter, bitter man. I don't think Peanuts is funny at all, or at least it wasn't in the early days. I don't see any humor at all in Charlie Brown's problems; in fact, the strip usually gets me in a bad mood. I always wanted to see Charlie Brown snap and beat people up and WIN. I hate hate HATE "good loser" stories. I've been the "good loser" way too much and I don't want to be one, and I don't want anyone else to be one. What's weird is that I liked the strip so much when I was a kid, but the older I get the less I like it. At least the way I see it, since Charlie Brown's always being punished and the others never are, it's like the sympathies are with the bullies. This is wrong. Then again, I'm not sure if I'm really a true Christian in the first place. So my analysis is worthless. Maybe my utter hatred of "good loser" stories is the root of a lot of my problems with Christianity (frankly, if it were salvation by works alone, I'd be more faithful). Sorry for derailing this; it's just my $7.32 (it's too long to be just two cents). Welcome to the blog of Richard Beck, author and professor of psychology at Abilene Christian University (beckr@acu.edu). Experimental Theology is also available on the Kindle. Part 3: "My Vocation is Love"
"A Home for Demons...and the Merchants Weep"
"All That Are Here Are Humans"
Can Patriarchalists Pray the Lord's Prayer? Pragmatics or Power in Patriarchy? Can We Believe in God Non-violently? Part 2: Who is Christ for Us Today? Part 1: Jesus and Violence Toward People or Property? Instead of a Coffee Shop How About a Laundromat? "The People At Our Church Die A Lot"
Part 2: "Do One Wrong Thing and You're Tainted"
Can you sin on a deserted island? Unspoken Sermons: "The Narrow Circle of Their Heaven"
Faith after "The Cognitive Turn"
Proudly powered by Blogger. Converted by Smashing Blogger for LiteThemes.com.